Archives for February 2017 | Evelyn Mc Marketing! Hi everyone! 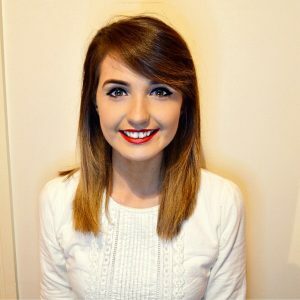 My name is Shannon Thackrah, a digital marketing student from IT Sligo and book blogger currently on work placement with Evelyn, and I am here today to tell you about a very exciting project currently underway- Reveal the Teen! This project came about as Evelyn also has two Transition Year students from Loreto College Letterkenny with her on work experience until May and she wanted to devise a project for us all to work on together as part of a team. Claire McGettigan and Joanna McMonagle (the two TY students) and Evelyn set about ideas for a project and #revealtheteen was born. Both Claire and Joanna noticed that there was a definite lack of choice of activity for people and teens their age in Donegal. They began to wonder what other teens thought of the services that were available in the county, how did they spend their time? Claire and Joanna worked together with Evelyn to expand on their idea and create the brand Reveal The Teen. But what is Reveal The Teen? 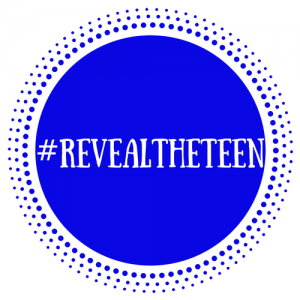 Reveal The Teen is a market research brand that is hoping to gain insight into how teenagers in Donegal shop, what their relationship is with money, their purchasing power and the ways they spend their time. As a team we decided that the best way to find out this information would be by going out and directly asking teens! With Evelyn we created a survey, which can be taken here and carried out both online and physical offline surveys of teens. Social media pages such as Facebook and Instagram were created, which I helped with design of graphics and logo’s, to target teens on those social media platforms. 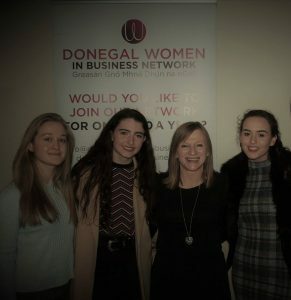 With large engagement so far on both social media accounts, we have also been spreading the message of Reveal the Teen online when Rachel from Donegal Woman interviewed Claire and Joanna and then they were invited to talk with Shaun Doherty on his show on Highland Radio. 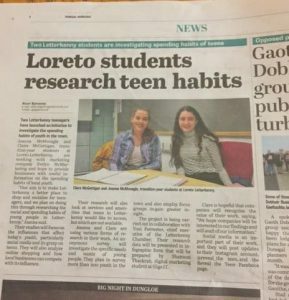 The girls also appeared in local newspaper and Toni from the Letterkenny Chamber of Commerce supported the project by offering #shopLK vouchers as a prize to one lucky person who completes the survey. I was completely taken by the idea of this project because of how unique and interesting it is. I’ve loved being a part of the project so far and cannot wait to continue to work on it and see the final results. I will be responsible for collating all the details from the survey into a report and producing info-graphics to present at the official launch in March. I think it is brilliant to have a team of such engaging and motivated business minded women working on this project. With big buzz already surrounding the Reveal The Teen project, Claire Mc Gettigan, Joanna Mc Monagle, Evelyn Mc Glynn and I are all very excited to see the results and share them with you all! If you would like to find out more about Reveal the Teen or see some of the online content for the project, follow Reveal The Teen on Facebook and Instagram.